I met the guys from MixMax at the Inbox Love conference in October. They have a really cool Chrome extension that enhances the Gmail email compose editor with some interactive features. 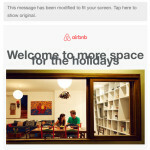 Gmail Rolls Back Font-Size Changes on iOS App.